Walk into a grocery store or coffee shop in any size town and you will see a bulletin board covered with posters promoting a wide assortment of causes, charities and events. Community events can be big or small and take place anywhere that communities get together. And that spells marketing opportunities for savvy business people. A local business’ success is closely tied into the local community, so it’s important to be an active and visible participant. When you contribute to these activities, you build relationships with like-minded business people who can either become clients or refer you to others who could benefit from your services. Help your staff give back to their community and your business is likely to benefit from their increased engagement and productivity. Companies giving back through “good works” makes very good business sense. These activities stimulate economies, develop community awareness, increase public involvement, and improve quality of life. Driving sales – Promote your volunteering efforts through your regular advertising. You can also run your own promotion where a portion of sales is donated to your chosen cause. Building brand awareness – Harness the marketing buzz around the program and use all public relations and social media opportunities. Collecting sales leads – Participating in charitable events will give you access to their donor and vendor databases. The events themselves can be used for product sampling opportunities, collecting surveys and general networking. Measuring Marketing Effectiveness – Running targeted promotions for your cause provides you the opportunity to measure a program’s success in a short amount of time. When you are participating in a charity for altruistic reasons, there’s no reason why you shouldn’t benefit from the resulting positive exposure. From your local Alzheimer’s chapter to the YMCA, there is a wide selection of projects to choose from. Look for opportunities that provide you meaningful exposure to a large number of influential people or high profile causes that attract media coverage. It makes even more sense where there is a logical match between your business and the activity. As an example, if you own an automotive repair shop, a tie in with the local Meal on Wheels program makes sense. Allowing staff to choose the cause that is closest to their hearts can also pay off tenfold. They may already have the connections and knowledge needed to participate with their chosen charity in the most effective way. You should also consider having small promo items on hand to thank volunteers and recruit others to lend a helping hand. A great way to start is t-shirts, a preferred promo in the nonprofit universe. T-shirts are inexpensive and land a powerful branding punch. Other branded items such as pens, note pads, water bottles, caps, microfiber cloths and key chains are great handouts as well. National Volunteer Week runs from April 10-17 this year. So it’s the perfect time to make your mark in your community! Your employees will enjoy the opportunity to devote time to a worthy cause and feel proud to be part of a company that promotes the well-being for all. 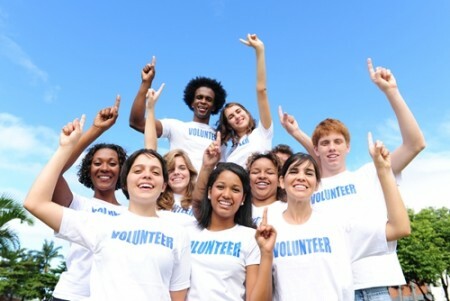 Remember, volunteerism is a win-win for your community, business and heart. Terry Shatner is responsible for supporting vendor partnerships, product and sales operations at Myron. She is a strategic thinker with demonstrated success in marketing, promotions, the promotions industry, and sales operations in both B2C and B2B markets.